Don't miss an inch of your seedling's growth with this outdoor-inspired cotton chart. Like a flower on the first warm days of spring, your little seedling is growing fast. Don't miss an inch with this outdoor-inspired growth chart that reaches up to big kid level (aka five feet). 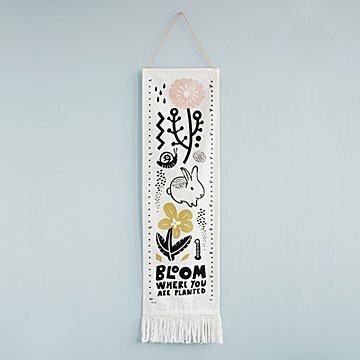 Each cotton design is loomed in India and screen-printed with garden friends like a speckled bunny, inchworm, and smiling snail. Finished with an inspiring phrase, "Bloom where you're planted," it makes a sunny baby shower or birthday gift. Made in India.